Some were “of illicit origin”. Documents had been unlawfully removed from the bird sanctuary by an ex director. Painting stolen was by painter Marc-Aurèle Fortin. Parts of the site have been destroyed by poaching stones. Fake “limited-edition” Hirsts that were sold online. Recovered at a business close to the site of theft. Stole 40 works of art while acting as a caretaker. Possibly stolen for scrap; no security cameras in the area. Brand thinks that the thieves weren’t organised by the IRA but were sympathisers. The antique medical supplies were stolen from an Alaska resident. An illustration by author Günter Grass. They had been in the church for over 100 years. LED panels will be replaced but the work won’t be the same. Theft was to sell the container, not for the brain piece. Theft didn’t change plans for a traditional procession. Only 25 people live in the council but none of them saw the theft from the tower. Renaming, withdrawal of collection, and now the court. It took four years of negotiations to have the piece returned. Wallingford Castle was damaged when someone pushed over stonework. Cezanne’s The Card Players sale was more complicated and less financially absurd than reported. Victim’s son in law noticed the pieces on an auction website. Gweagal shield which was seized by Captain Cook. 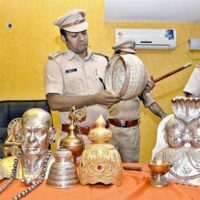 Andhra Pradesh will be using documentation to help with their idol theft problem. Previously other monuments at the site had been damaged and destroyed by treasure hunters. Deputy Superintendent of Police Khader Batcha is wanted for idol smuggling. Community and control in rebuilding a destroyed monument. Stolen from Songgwang Temple in Suncheon in the early 70s. Royal Seal of Queen Munjeong and Royal Seal of King Hyeonjong were unlawfully removed from Korea at an unknown time. Taken from Wang Tawan Tok Temple in Nakhon Si Themmarat province. Antiquities as payment for a 1997 suicide bombing in Israel? Bonkers. Where Abu Bakr al-Baghdadi proclaimed a “caliphate” in 2014. Returning to the province of Antalya following a Swiss court ruling. The human toe goes in the cocktail, then you drink the cocktail. Really. And someone stole it. With a note of apology. Difficult to determine if ivory is legal or banned; rough for traditional craftspeople. Burglars climbed a barbed wire fence and forced their way in through a window. Money put up by a local resident who is a fan of the museum.